This is one of the biggest furniture transformations (and they're all big to me!) so far! This sweet chest of drawers was an estate sale leftover with broken trim and handles, but the son saved it and knew it would find just the right home with a refinisher. 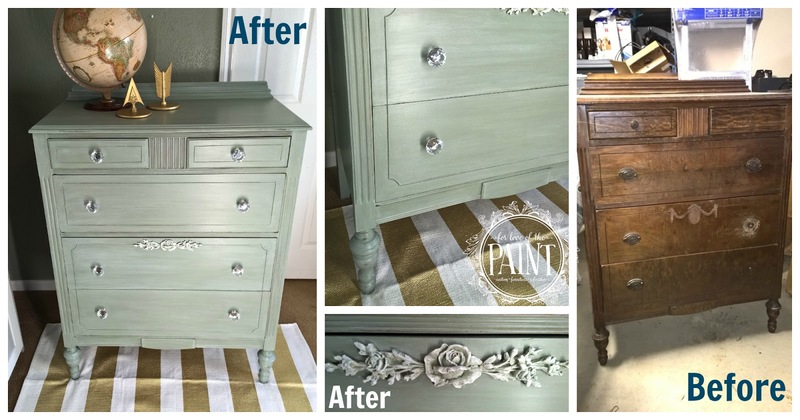 I'm so blown away by the Before and After on this piece, and so grateful to be able to help it find a second life! We did some patching and sanding, with an allover sand to follow to help the Milk Paint adhere. 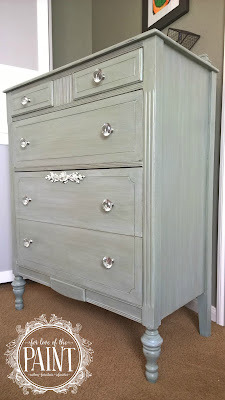 For this dresser, I used General Finishes Milk Paint in Basil, a soft sage green with some gray tones. I put on two coats of paint, then distressed along high points and edges, and almost left it with the more uniform paint, but I'm glad I didn't! A friend had given me some Winter White glaze to try, so I painted it on and wiped it off for a color wash, let it dry a bit, and then came back to dry brush on a bit more of the glaze for a chic and antique look. We replaced the trim with a resin flower, which I painted in a blend of Basil and Snow White, and found some chic crystal style knobs to replace the hardware. What a huge facelift! This highboy had a great structure, but was definitely a diamond in the rough. I can't wait to see it find a new home and be loved by another family! Here's one more - look at those legs!! Do you have a piece that's in need of some love? If you're in the Austin area, I'd be honored to see if there's some magic we can work with it! This is beautiful! I love the lighter green color. How much did the white glaze lighten the 2 coats of basil milk paint? Would like to paint my kitchen cabinets with this shade of green but without the distressing or antiqued look...wonder if some white milk paint would need to be added to the basil to get this lighter green shade? Any recommendations? Hi Crysta, thanks for checking out this project! It's one of my favorite Before and Afters :) The glaze lightened the color at least a shade or so - I first brushed it on/wiped it off, which created a sort of washed look, then came back and dry brushed to create the antiqued/old wood look texture. I think you could definitely blend the Basil with a small amount of Snow White and/or Antique White for more of a solid seafoam color! I would love for you to share photos if you do! !